Delsey Rennes Collection Spinner Suitcase - 25? CLOSEOUTS. 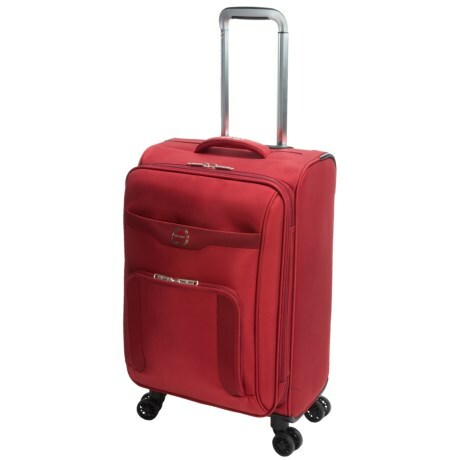 A soft-sided rolling suitcase with rugged fabric and exterior pockets, Delseyand#39;s Rennes Collection 25and" spinner suitcase offers plentiful storage and lightweight maneuverability. Available Colors: RED, BLACK. Delsey Rennes Collection Spinner Suitcase - 29? CLOSEOUTS. A soft-sided rolling suitcase with rugged fabric and exterior pockets, Delseyand#39;s Rennes Collection 29and" spinner suitcase offers extra storage space and lightweight maneuverability. Available Colors: RED, BLACK.